Janakpurdham, 11 May 11- Indian Prime Minister Narendra Modi has said India’s beliefs, conviction and history would remain incomplete without Nepal. In his address to a civic felicitation organised in the honour of Indian Prime Minister Modi who is presently on a two-day State visit to Nepal, at Barhabigha Ground in religious and historic city Janakpur today, he said, “Hearts of Nepali are deeper than sea and Nepal’s sovereignty is higher than the Mount Everest. ” The ceremony was jointly organised by the Province 2 government and the Janakpur Sub Metropolis. “The Mithila region, the area which is held close by both Nepal and India is enriched by cultural beliefs. The Mithila culture is supreme in the world”, he said, adding that creations of Vidyapati (1352-1448), a well-known poet of the Mithila literature, kept equal significance and meaning for both countries. As stated by him on the occasion, the Mithila paintings are world famous and context presented in such arts are targeted at women’s empowerment and climate change and ecological awareness. Recalling the Nepal-India relations existing since the ancient time (Treta Yuga), Prime Minister Modi said the mutual trust, ownership and relations of bread and daughter had further strengthened such bilateral ties. He went on to say that the Ayodhya would be incomplete in absence of Ram-Janaki relations. The people of Nepal and India shared common happiness and challenges and dreams and dedications, underlining the need of collective efforts to deal with the issues. Stating that his visit to Nepal was primarily for religious purposes and arrived here as a pilgrimage as per the religious tradition of travelling to the certain religious shrines in Nepal including Pashupatinath and Janakpur after visiting some holy shrines in India. Terming Nepal as the center of spiritualism, he said he found everything in Nepal familiar and intimate to him. “Mithila is a land which was governed on the basis of welfare policies devised by a group of scholars like Gargi and Astabakra in King Janak’s court, which considers the people as the supreme,” he said. Stating that India was very soon going to be the third largest economy in the world, he said the manner in which India becomes prosperous Nepal’s development will also pick up momentum in the same manner. 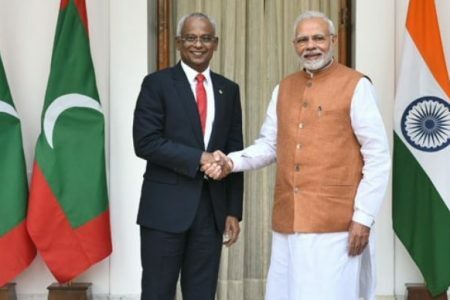 The Indian Prime Minister said that the federal, provincial and local level elections which were organised recently in Nepal were exemplary in this whole region. 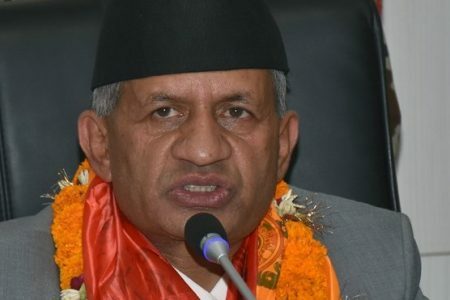 Expressing the confidence that Nepal’s development would pick up speed now as the formula of regional development has been linked to its development, he stressed the need of also increasing electricity, rail, customs check post, air service and waterways connectivity with Nepal. “Works on the Jayanagar-Janakpur Railway is now taking place rapidly now. This railway would come into operation within few days,” Prime Minister Modi said adding that railway service would be also run from Raxaul to Kathmandu. He stated that works on constructing the petroleum pipeline from Motihari to Amlekhgunj are also in progress. 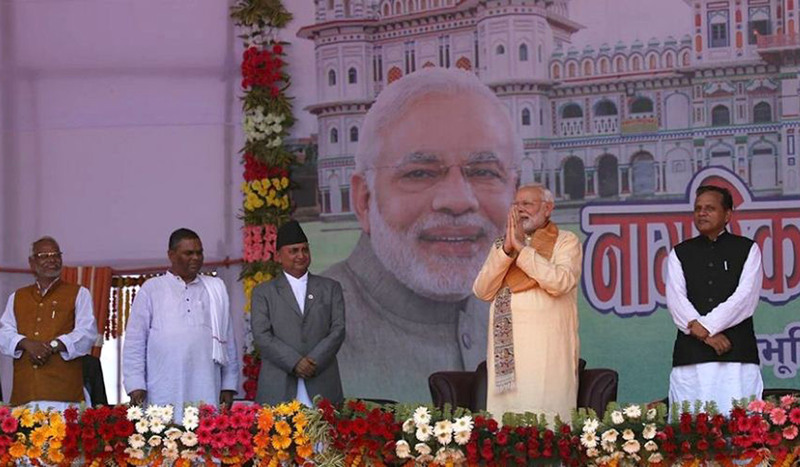 PM Modi pledges support for the development of Janakpur and its surrounding. He announced the support of one billion rupees for the purpose. He further said that the projects would be selected with the coordination of federal and provincial government. He also said that the support was from the whole Indian people for the goddess Sita. PM Modi committed to accelerate the Rayaman circuit adding that he was also active in developing of Buddha and Jain circuit. On another note, PM Modi opined that Nepal should work to the areas of establishing satellite adding that such satellite made by India was benefiting Nepal also. He also said that his plan of reaching cultural and religious city Janakpur was metalized today as he had wished for the same during his Nepal visit in 2014. PM Modi said that the holy place Janakapur was respectable to all who wish for peace. He had addressed the civic- reception in Nepali, Maithali and Hindi languages. Speaking in the programme, Minister for Defense Ishwar Pokharel said that Nepal wanted to be future-oriented rather going back to the past. He also said that the Janakpur city was harmonizing Nepal-India relations. He pointed out that Nepal and India are aware of sensitivity of each other and their proximity. 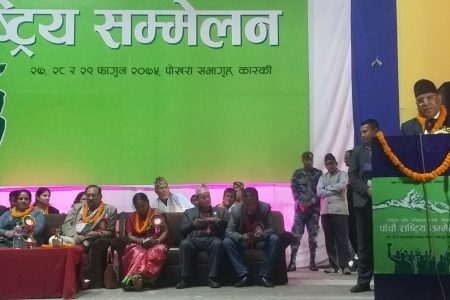 Chief Minister of Province 2 Lal Babu Raut said assistances are expected from all levels as the province is comparatively weak in economic. On the occasion, Mayor of Janakpur Sub Metropolitan City Lal Kishor Sah handed a felicitation letter written in three Maithili, Nepali and Hindi and the symbolic artistic key to the town. Artists from Mithila Natyakala Parishad performed various cultural dances and sang welcome songs.